These are such everyday occurrences in any garden, but they never cease to amaze us both. John and I can easily get excited over very ordinary things that many gardeners may take for granted. Either one will update the other if something worth mentioning or happenings are observed and we’ll monitor them ever so closely in joyful anticipation. Every once in a while, we get to experience the many remarkable marvels in our small garden that brings much joy, happiness and excitement in our daily lives. But, never sidelined or considered less exciting is the appearance of the first flowering of our plants, or the blossoming of subsequent ones. It’s likened to awaiting the emergence of our baby’s first tooth, wonderfully hopeful. We had two garden surprises in August. One of our potted Anthurium andraeanum (Flamingo Flower) plants, propagated by stem cuttings in March had decided to smile for us about 8 days ago. Its red flower bud was easily spotted against its complementary green heart-shaped foliage. Pretty soon, the tiny-winy pinkish red stud will blossom into a radiant beauty for sure. 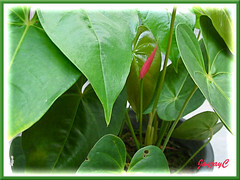 More information on Anthurium andraeanum or Flamingo Flower here. 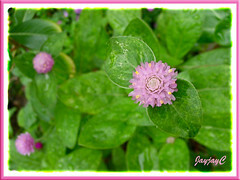 The other is the pastel pink-colored Gomphrena globosa that grew by seed germination, the easiest method of propagation, in late May. First time blossoming in late August, that would work out to about 3 months after sowing the seeds. How wonderful…quite an early bloomer! Commonly named as Bachelor’s Buttons, because of its globular flowerheads, resembling buttons.